EA just launched a new free-to-play online multiplayer game featuring the world's most popular golfer. Tiger Woods has had more than his share of troubles lately. Just in case you haven't heard about them, he apparently wore black shoes with a brown belt and there was a big hubbub about it. Regardless, EA does not appear to be reconsidering its support of the megastar as it has just launched Tiger Woods PGA Tour Online. The game appears to be the latest part of EA's free-to-play strategy, which also inlcudes Battlefield Heroes and BattleForge. 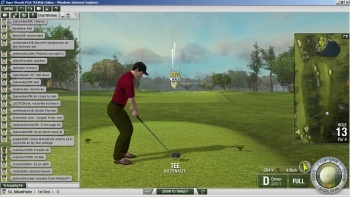 Tiger Woods Online is played through a web browser and can be enjoyed endlessly for the cost of a breath of air on featured courses. Subscription options are also available at $9.99 per month or $59.99 per year, which allow unlimited access to all courses. Golfers can be customized by purchasing items through the game's pro shop with in-game currency earned through play and bought with real simoleons. Subscribers will receive their own packages of points to spend in the pro shop. Tiger Woods Online's beta has been running for nearly a year, but the official launch has brought two new courses with it, making a total of ten now available. Players can of course participate in tournaments and even customize their own. Online chat is also available so the game's golfers can use disgusting profanity to exclaim the anger they experienced with their last failed putt. Free to play games have come a long way, now being associated with one of the biggest stars in the world despite his fashion faux-pas. I can still remember when they were but a selection of kart-racing games played chiefly in Korea and strangely stared at by most of us. Now EA, and many other companies, have gotten into the fray, and free-to-play is obviously a solid model for anything from MMORPGs to kart-racing to golf.